The most delicious harvest salad with tons of pomegranate arils, roasted sweet potatoes, diced apples, and toasted pecans. We’re drizzling it with a bright and fresh tasting orange dressing that makes this salad extra perfect to serve during the holidays! Today’s post is sponsored by Simply Beverages™ and SheKnows Media. And here it is: the perfect holiday side dish! Hold on tight because I’ve got a crunchy, zingy, bright, and fresh harvest salad comin’ your way. And as a much needed transition from the summer salad scene; it’s a NON-GREEN salad. Loaded with all the fall things. And we take it over the top with a orange poppy seed dressing that you’d want to drink up in a glass, because yes, it is that gosh darn good. Before I jump right into all the delicious components of this jeweled beauty of a salad, can I just say that the holidays are begging for a FRESHER approach? I mean sure, bring on all your regular faves. But once in a while, you just want a bowlful of something refreshing and totally different from our usual holiday food vibes, ya know? A big hello to the new ✨POSSIBILITIES✨ for those of us that suffer from sensitive stomach. I’m pretty stoked about this! It’s about time we were able to enjoy a glass of this citrusy nectar without having to think twice about the after effects. 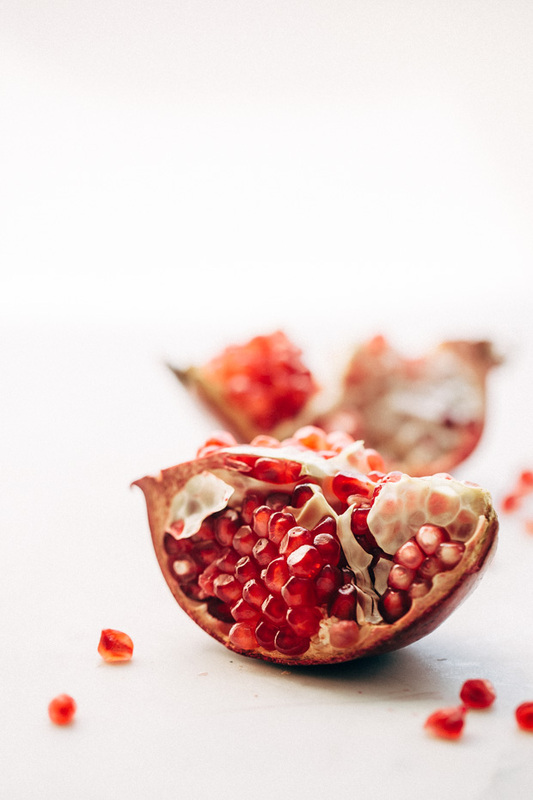 The reduced acid gives you a smooth, delicious taste without that acidic bite at the end that makes life so hard for some of us. And I love not having to compromise my values. It’s still 100% REAL, pure squeezed orange juice with calcium. It’s also NEVER frozen, from concentrate, or sweetened. I’m loving the sound of that. 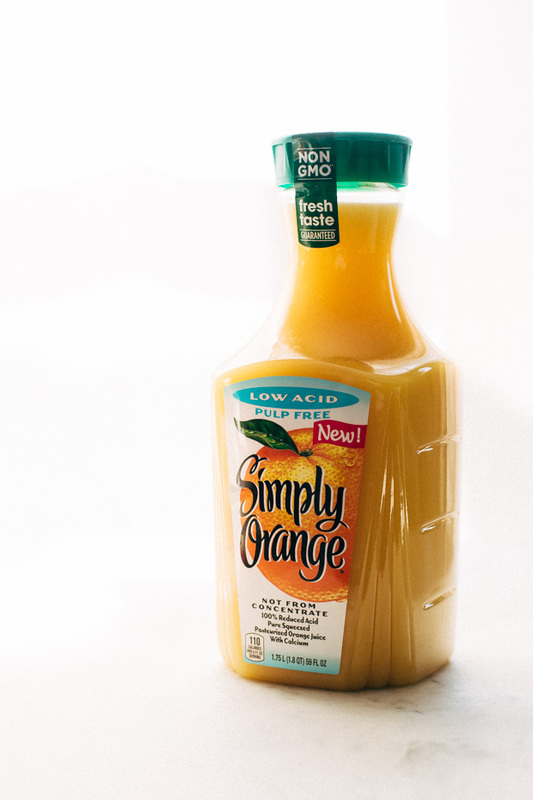 It’s time we fell in love with OJ all over again. We’ve got options now. 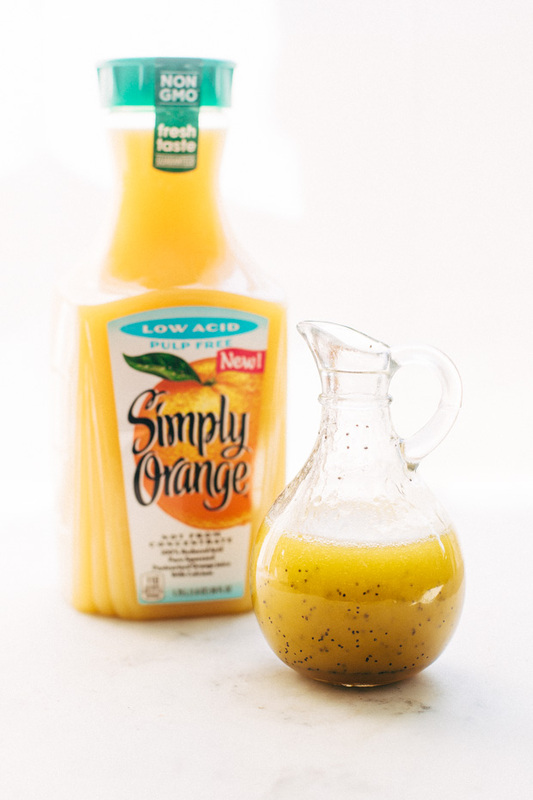 So let’s talk about this super simple orange poppy seed dressing. It’s hardly even a recipe because it’s literally the easiest thing you’ll make this holiday season. It’s made with just a handful of ingredients. Say, olive oil, white wine vinegar (or champagne vinegar would be delicious too), poppy seeds, honey, and Simply Orange® Low Acid . The short list of ingredients really allows the harvest salad components to shine bright. Add the dressing ingredients to a bowl and give it a quick whisk or just blend it in a blender. That’s it! This harvest salad recipe is easily customizable with your favorite healthy ingredients. 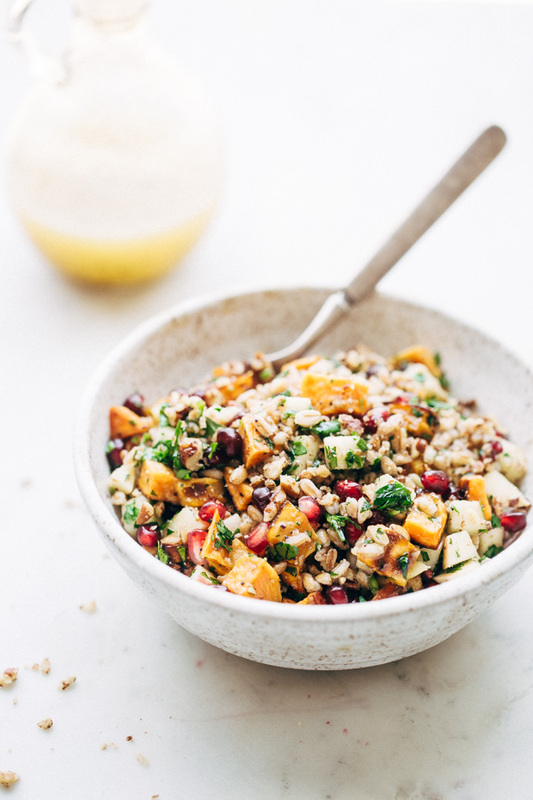 We like roasted sweet potatoes, diced apples, pomegranate arils, farro, chopped pecans, and for freshness, parsley. Here are some swaps that would work equally well: butternut squash, diced pears, dried cranberries, walnuts, cashews, quinoa, brown rice, couscous, freekeh, and cilantro. For more protein add: leftover diced turkey or rotisserie chicken. 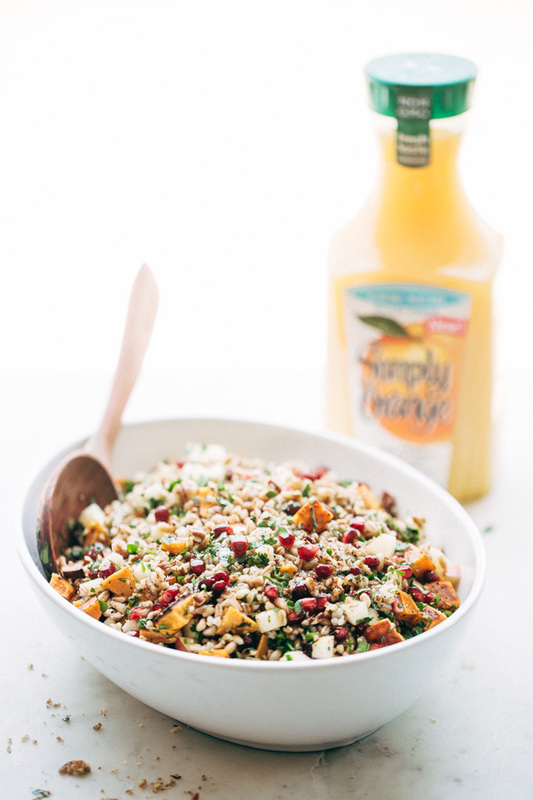 Pop all the harvest salad ingredients into a big bowl and just drizzle that glowy orange poppy seed dressing on top. Toss it together and you’ve got the most refreshing, bright pop-of-color side dish. 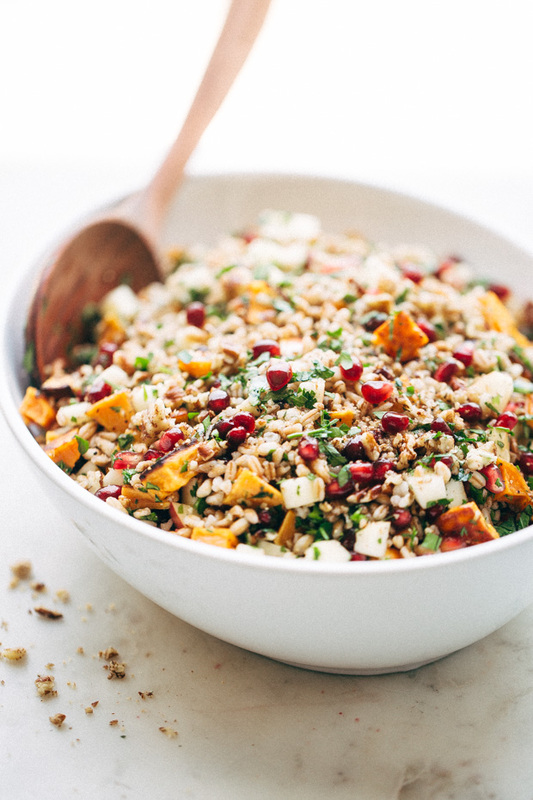 This autumn salad is seriously begging to get on your holiday menu! Now I wanna hear from you! Tell me, what are the ways you use orange juice during the holiday season? The most delicious harvest salad with tons of pomegranate arils, roasted sweet potatoes, diced apples, and toasted pecans. We’re drizzling it with a bright and fresh orange dressing that makes this salad extra perfect to serve during the holidays! Combine the salad ingredients in a bowl. Add the dressing ingredients to a bowl and whisk until the dressing is combined. Alternately, you can just blend it together in a blender. Drizzle the dressing on the salad ingredients. Toss to combine. Season with salt and pepper to taste. To make this a complete meal or for more protein, add cooked diced turkey breasts, or rotisserie chicken. 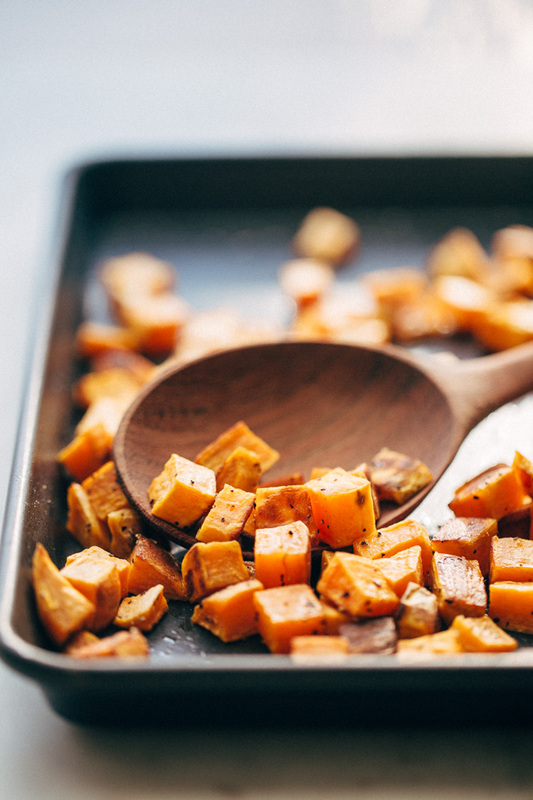 To roast the potatoes – dice 2 medium sweet potatoes into a ½ inch dice. Drizzle with a couple tablespoons of olive oil and salt and pepper. Toss to combine. Roast in a 425ºF oven for 20-25 minutes or until the potatoes and tender. Thank you to Simply Beverages™ and She Knows Media for sponsoring this post! We truly love partnering with companies that promote wholesome, quality ingredients! This giveaway is open to US Residents age 18 or older (or nineteen (19) years of age or older in Alabama and Nebraska). Winners will be selected via random draw, and will be notified by e-mail. The notification email will come directly from BlogHer via the [email protected] email address. You will have 2 business days to respond; otherwise a new winner will be selected. The Official Rules are available here . This sweepstakes runs from 11/21/16-12/31/16. Be sure to visit the Simply Beverages  Page on BlogHer.com where you can read other bloggers’ posts!